Hello everyone, I hope your week treated you alight! Today is opening day over at the Big Shot Brilliance Event with UStamp with Dawn and Friends. If you haven’t purchased your pass, just click on the blinkie on my sidebar and it will take you where you need to go. This event has some truly awesome projects to inspire you to get out your Big Shot. 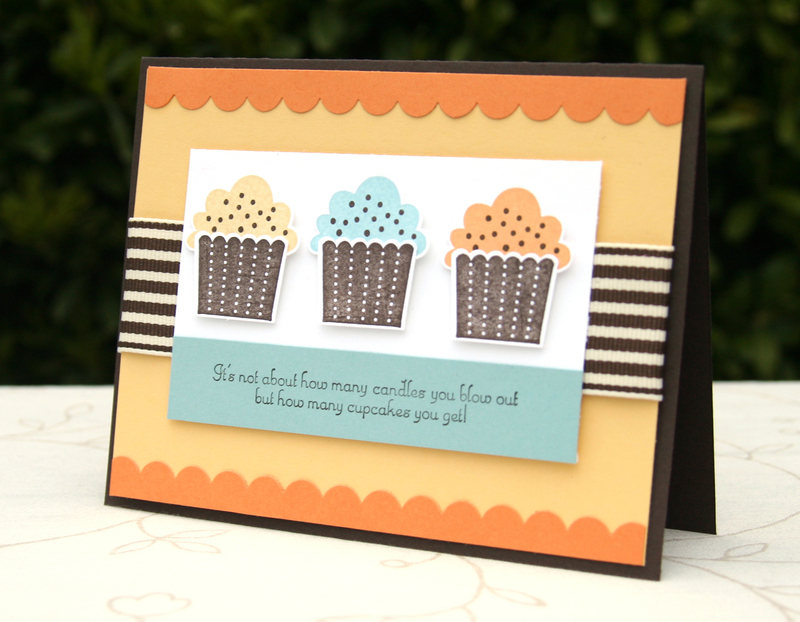 Today’s project is another card made using the Create a Cupcake Stamp Set. A little tip to putting your cupcakes together: I stamped them, then punched them out and instead of gluing the top and bottom together (which can be tedious work) I attached a dimensional to the bottom portion and one to the top portion. Then I put the bottom where I wanted it and tucked the top in above it. It is quick and simple. Love your color scheme and using ribbon behind the focal point. Your photography is beautiful too! Very pretty card! This is not a color combo that I would have put together, but it is great! I will have to give it a try!